As Championships are wrapped up, and champion’s are crowned, the 2012 season has come to a close. It’s been another year of hot highs and soggy low’s, both for drivers & teams as well as the Sport itself. So much has happened this year, its gonna be hard to talk about it all. It has been a very tough year for the sport. The season started disastrously, some even questioning the sports future existence. But we now have what appears to be a very good and stable future ahead. The year started with the WRC’s Global Promoter North One Sport being sacked due to their failing to meet the FIA’s contractual agreement. Depending on what u read and what rumours you heard some say they were on the verge of a multimillion pound deal. But the sport had taken a bad turn. No Promoter, no media rights holder, no owner, no TV, nothing. All we had were 2 manufacture works teams Citroen & Ford. With Mini saying they were in, ‘sort of’…. But that was all we needed. Kicking off in Monte Carlo, the teams and Drivers still turned up, and did what they do best. Fight to win. In doing so they put on a great show. And thanks to Eurosports last minute round up for the TV and Timing, Loeb went ahead to win it again. Next up was Sweden. Stage 1 Technology were back in force for the tracking and timing. Motors TV in the UK at least had the 30min daily coverage. With Colin Clark and rally Guru Julian Porter commentating the show. It was a battle on snow and ice. And Fords Jari Matti Latvala took the win after crashing out on Monte Carlo. Then it was off to Mexico. The Monster team returned with Ken Block and Chris Atkinson. 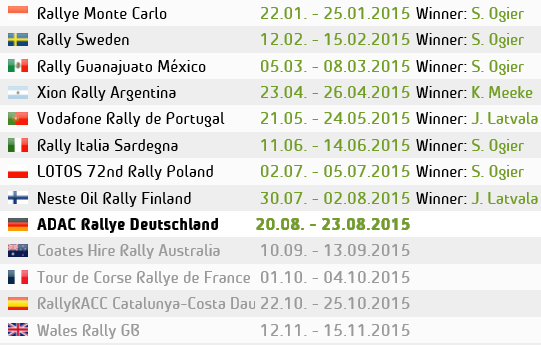 Despite Atko setting some great stage times he retired with suspension damaged. He joined many others who suffered drama on the South American event. The worst was for title challenger Latvala who rolled out of his 2nd rally. Loeb went on to win his 2nd event of the season. We were promised by his Majesty the Todt that we would have a Promoter by the end of Portugal – Portugal was up next, it was an event I was able to go along for. And what a memorable rally it was. Drama from start to finish. The event started with 3 evening stages on Thursday night. On the Night stage, SS2. The unthinkable happened….. Loeb Crashed out the rally. No Loeb meant big fight to win, and Fords best chance of a good result. The locals said it hadn’t rain in 4 months, so of course, the following day we had 4 months of rain on Day 1 of the rally. We were standing Stage side, we could see the road go along the top of the hill ridge, which worked its way down into the little valley at the bottom with a dry gully. First car made its way down, the gully was mearly a puddle at this point. 4 cars later and the gully was like a raging lake crossing. Cars almost stopping to go through it covered by a wall of water. While feeling like I jumped in a lake fully clothed we watched as Tanak slid off the road and into the bushes. Cars were skating like they were on ice. After finally admitting defeat to standing on a cold wet windy hill side we took cover in the mini bus and attempted to rinse our clothes dry. For the afternoon loop, after finally managing to order coffee in a lovely small Portuguese village, with the english language proving useless, we went on to SS8, to a great viewing spot, over looking a lot of the stage from a corner on the top of the road. Or at least it would have been if we could see. After the Rain had mostly stopped the conditions turned to thick fog, when I say thick, it was like looking through a glass of Cloudy Soup with a net curtain over your head. We had info that the stage had been delayed due to Breen’s S2000 being stranded in a flooded road on the way to the first stage of the Afternoon. This blocked the road and all the WRC crews were called back into service. Stages were delayed, Then we got news that, due to the conditions being so bad, the afternoon of Day 1 was not just delayed but cancelled. So after a few hours in a mini bus trying to work out what we could see out the window, it was back to the hotel to dry off and reflect on the days action. Due to the conditions, most of the field lost time or went out. With no Loeb it was Fords chance to leap ahead in the Championship, but in the mornings chaos, Latvala slid off and out of the rally, an then on the following stage Solberg hit a rock and crashed out, A big blow to Fords title chase and a day to forget for team boss Malcolm Wilson. Day 2 wasn’t so bad and neither was Day 3, the conditions had dried up and the driver who survived day 1 could get on with driving his DS3 as a rally car rather than a boat with no rudder. By the end of the rally it was Citroen’s number 2, Mikko Hirvonen at the top. The Fin doing exactly what he was asked to do, to pick where Loeb left the road. The perfect team player. Taking it easy in the tricky conditions and more importantly keeping it on the road, then inching out a big gap. Hirvonen came into final service on Sunday, to the cheers of his new team, with the Champaign out and the red flags waving. His first win for Citroen….. Or was it?!….. The unforgetable, unpredictable Rally Portugal hadn’t finished with the WRC crews yet. Despite standing on the top of the podium at the finishing ceremony, later that evening while the teams were getting the after party started, the words coming out from the Media centre were that Citroen and the FIA where having a meeting. It turns out that there was a part on Hirvonen’s Citroen DS3 turbo that didn’t comply with the regulations. Therefore meaning, after scrutineering Hirvo was disqualified. Handing the Rally Portugal win to Mads Ostberg. Giving the privateer Norwegian his first WRC Career win. And after surviving day 1 and battling to keep ahead of Novikov in 3rd, it was still a well deserved victory.